Without question, the production of The Who’s Tommy running in the DCPA’s Stage Theater is the best rock concert in Denver these days. From the first house-rattling distortion-filtered guitar lick of the verture, you hear that Music Director Greg Coffin and Conductor Angela Steiner have created a true and faithful orchestral rendition of Pete Townshend and the Who’s rock opera. The wall of sound in the room is alone well worth admission. I was heartened to see a good number of the audience come down to the orchestra pit after curtain call to watch the band play out the exit music – and receive a welcome round of applause at the end. It has to be said though, that a rock concert is not in and of itself a true theatrical experience, but a spectacle designed to enhance the music. A rock concert often uses elements of theater – sets, costumes, lighting, effects, even a loose story – to achieve an artistic experience, but what is on a rock concerts stage is not “theater” in that the music, solely, absent the other elements, remains the star. 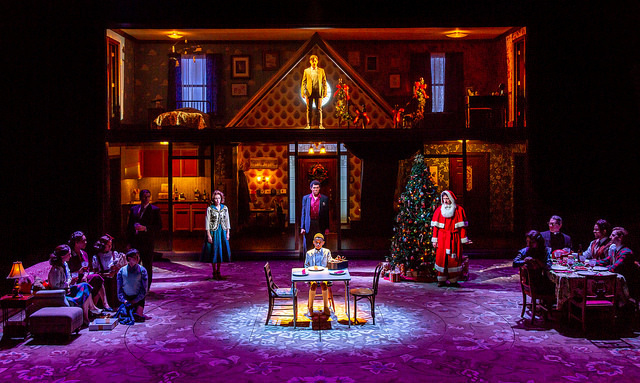 Here, with DCPA Theater Company’s production of Tommy – the story of the “deaf, dumb and blind kid”, traumatized by witnessing a murder, who goes on to become a pinball wizard and is hailed as a new messiah – the spectacle of the show’s intricate production design well outshines the characters and actors telling Tommy’s story. 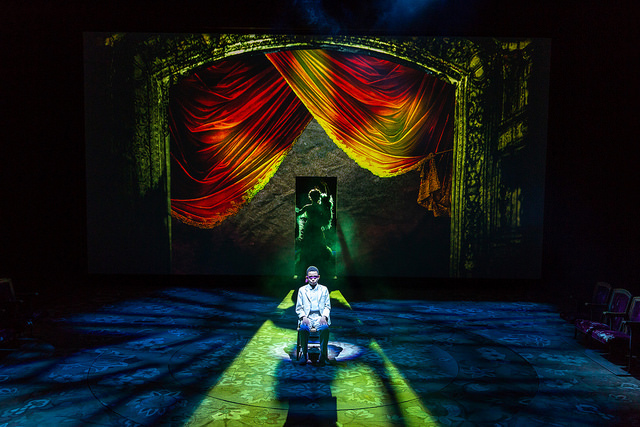 Projection Designer Jason Sherwood, Lighting Designer David Wisner, and Sound Designer Ken Travis are to be commended for their extraordinary use of the space, and their success in crafting such a technically marvelous production. It is these marvels of the design and orchestration that make the actors’ performances feel small and almost inconsequential in comparison. Dwarfed by the space, the actors seem to be more akin to props – additional pieces to be moved around the stage. With such extensive technical wonders, the actors, although polished and solidly in their moments, seemed wary of the set pieces as they flew around them. One has to give credit to young Samuel Bird as Tommy (Age 4), who navigated the shifting stage like a pro alone during the overture. Central to the tight ensemble cast are Betsy Morgan as Mrs. Walker, Tommy’s mother, and Charl Brown as Captain Walker, Tommy’s father. 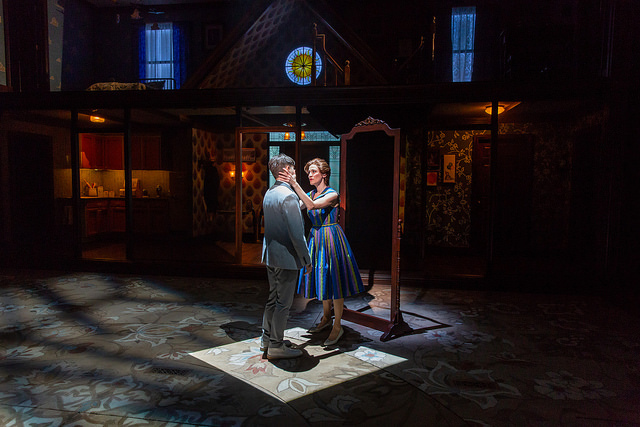 Each bring an earnest, British stiff-upper- lip to their performances, and their vocals are as strong as one would expect from a production of this quality. Particularly striking are their duets during “Twenty-One” and “I Believe My Own Eyes”. I do note that Brown brought a certain Motown sound to his voice, which pulled me out momentarily from the rock opera orchestration around him. Additionally we have the famed nasty duo of Uncle Ernie, played by Carson Elrod, and Cousin Kevin, played as a youth by Charlie Korman and as an adult by Gareth Keegan. Each actor brings just the right amount of sleaze required for their roles. The director’s take on Uncle Ernie’s controversial “Fiddle About” number maintained the sense of unease an audience should feel, while avoiding any true vulgarity which has, in my experience, turned off audiences in other productions. Korman and Keegan’s. Cousin Kevin also struck a nice balance as Tommy’s tormenter and guide as he moves from disability into fame. Korman’s interpretation of “Cousin Kevin” as a youth was a very fun glimpse of a sociopath in training. Any conversation about the vocals in Tommy would be remiss not to mention the Gypsy’s “Acid Queen”. 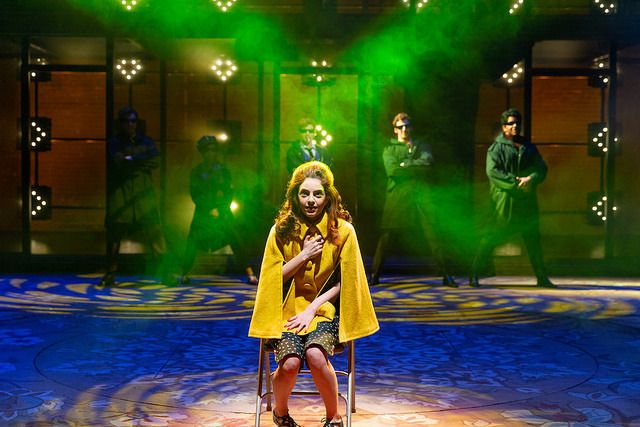 As much an anthem as “Sensation” or “Listening To You”, a staging’s version of the “Acid Queen” is a hallmark of the production’s quality. The bare strength and emotion of Lulu Fall’s interpretation of the song did not disappoint; her voice literally raises the hairs on the back of your neck. I was, ultimately, disappointed though by the staging which gave the Gypsy little to do other than strut the stage around Tommy in a negligee; some additional gravity to the scene would have been welcome. The central character of Tommy is the heart and soul of the show. Andy Mientus (veteran of Broadways’ Spring Awakening, Les Mis, and Wicked, as well as NBC’s musical theater TV show Smash) is our white suit-clad messianic figure here. Tommy serves as his own narrator, guiding the audience, and his younger selves through the inner life of a “deaf, dumb and blind kid”. It’s the connection with the elder Tommy which anchors the story for the audience, and his charm and charisma which makes (or breaks) the show. Mientus, while vocally adequate in the role, simply lacks the raw rock-star glamour necessary to draw an audience in; the dynamism to tie the productions’ elements together into something larger than orchestration or the spectacle around him. While I definitely enjoyed Mientus’ performance, I was left wanting more from this Pinball Wizard – a justification for the adoration around him. A performance can only go so far on lights, projections and spectacle. I missed the depth of the character – the man-child thrust into fame he doesn’t understand; a dazzled newfound freedom; a sense of that late-60’s optimism, opportunity, and danger where the musical sprung from. Ultimately, the music and the spectacle of Tommy’s story is the star, and probably rightly so. This show is indeed well worth the ticket. I was personally excited to see younger audience members in Who tee-shirts rocking out in their seats and mingling with those standard DCPA audience members of a certain age. 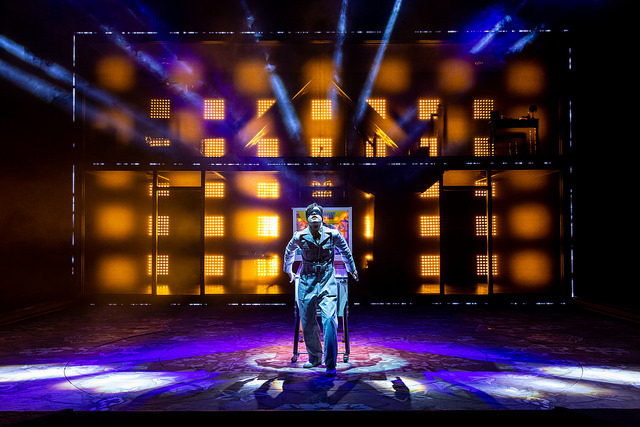 With DCPA’s mounting of The Who’s Tommy, Baby Boomers and Gen X’ers have a wonderful chance to share this marvelous rock opera with a new generation, and I heartily encourage they do so! 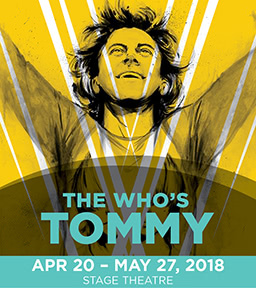 Be prepared to rock out to the THE WHO’S TOMMY, playing now through May 27th at the Stage Theatre in the Denver Center Complex. For tickets or more information, contact the Denver Center Box Office by calling 303-893-4100 or online at www.denvercenter.org.